During IODP Expeditions 304 and 305 (Nov 2004 - Feb 2005), we have drilled a 1415 meter deep hole in the Atlantis Massif, an oceanic core complex located at 30°, east of the Mid-Atlantic Ridge. The recovered section ( 75% recovery) is essentially gabbroic, with a variety of lithologies ranging from troctolites to diabase and basalts. It contains in particular a series of very olivine-rich troctolites, dunites and wehrlites, that are locally very fresh (<1-2% serpentinite) and constitute a unique record in ocean drilling history. This oceanic crustal section is the most primitive drilled so far, and is moderately altered at conditions ranging from granulite to zeolite facies. The low-angle detachment fault that caps the Atlantis massif is mostly associated to low-temperature, greenschist facies, ductile to brittle deformation. The central dome is clearly not an uplifted dominantly upper mantle section, as had been inferred prior to drilling from available geological and geophysical data, pointing to significant lateral lithological heterogeneity over short distances. Blackman, D.K., Ildefonse, B., John, B.E., MacLeod, C.J., Ohara, Y., Miller, D.J., and the Expedition 304/305 Project Team, 2004. Oceanic core complex formation, Atlantis Massif—oceanic core complex formation, Atlantis Massif, Mid-Atlantic Ridge : drilling into the footwall and hanging wall of a tectonic exposure of deep, young oceanic lithosphere to study deformation, alteration, and melt generation. IODP Sci. Prosp., 304/305. doi:10.2204/iodp.sp.304305.2004. IODP 304/305 Shipboard Scientific Party, 2005. Drilling at Atlantis massif oceanic core complex. IODP expeditions 304 and 305. EGU Vienna. Geophysical Research Abstracts, Vol. 7, 05896, 2005. John, B.E., Blackman, D., Ildefonse, B., Ohara, Y., Miller, D.J., and IODP 304/305 Shipboard Science Party, 2005. Crustal Accretion and Denudation Processes at Slow Spreading MOR - Insight From IODP Hole U1309D (MAR 30°N). Eos Trans. AGU, 86(52), Fall Meet. Suppl., Abstract T33G-04 (Invited). Blackman, D., Ildefonse, B., John, B., Ohara, Y., Miller, D.J., MacLeod, C., and IODP 304/305 Shipboard Science Party, 2005. Geophysical Constraints on the Nature of Atlantis Massif, 30°N MAR. Eos Trans. AGU, 86(52), Fall Meet. Suppl., Abstract T33G-05 (invited). Expedition Scientific Party, 2005. Oceanic core complex formation, Atlantis Massif—oceanic core complex formation, Atlantis Massif, Mid-Atlantic Ridge : drilling into the footwall and hanging wall of a tectonic exposure of deep, young oceanic lithosphere to study deformation, alteration, and melt generation. IODP Prel. Rept., 304. doi:10:2204/iodp.pr.304.2005. Expedition Scientific Party, 2005. Oceanic core complex formation, Atlantis Massif—oceanic core complex formation, Atlantis Massif, Mid-Atlantic Ridge : drilling into the footwall and hanging wall of a tectonic exposure of deep, young oceanic lithosphere to study deformation, alteration, and melt generation. IODP Prel. Rept., 305. doi:10:2204/iodp.pr.305.2005. IODP Expeditions 304-305 Scientists, 2005. 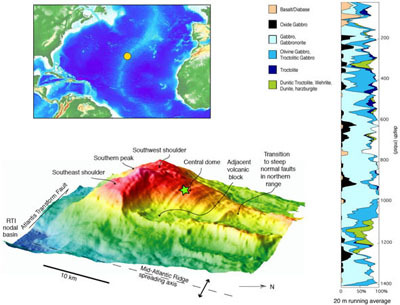 IODP Expeditions 304 and 305 : Oceanic Core Complex formation, Atlantis Massif. Scientific Drilling, 1 : 28-31. Ildefonse, B., Blackman, D., John, B.E., Ohara, Y., Miller, D.J., MacLeod, C.J., and IODP Expeditions 304-305 Scientific Party, 2005. A revised model of oceanic core complex structure ? Indications from IODP expeditions 304-305, Mid-Atlantic Ridge, 30°N, and previous ocean drilling results. Geophysical Research Abstracts, Vol. 8, 05723, SRef-ID : 1607-7962/gra/EGU06-A-05723. Ildefonse, B., Blackman, D.K., john, B.E., Ohara, Y., Miller, D.J., MacLeod, C.J., and the IODP Expeditions 304-305 Scientists, 2006. IODP Expeditions 304 & 305 Characterize the Lithology, Structure, and Alteration of an Oceanic Core Complex. Scientific Drilling, 3, 4-11, doi:10.2204/iodp.sd.3.01.2006. Ildefonse, B., Drouin, M., Violay, M., and Pezard, P.A., 2009. Electrical properties of gabbroic and troctolitic rocks from IODP Hole U1309D, Mid-Atlantic Ridge, 30°N. EGU General Assembly 2009, Vienna (Austria), April 19-24, 2009. Geophysical Research Abstracts, Vol. 11, EGU2009-3737. Ildefonse, B., Godard, M., and Drouin, M., 2010. The Atlantis Massif : An Illustration of the Interplay Between Core Complex Development and Magmatic Activity. AGU Chapman Conference on Detachments in Oceanic Lithosphere : Deformation, Magmatism, Fluid Flow, and Ecosystems, Agros, Cyprus, 9-15 May 2010. Godard, M., and Ildefonse, B., 2010. Geochemistry of IODP Site U1309 Gabbroic Series (Atlantis Massif) : Evidence for High and Cyclic Magmatic Activity. AGU Chapman Conference on Detachments in Oceanic Lithosphere : Deformation, Magmatism, Fluid Flow, and Ecosystems, Agros, Cyprus, 9-15 May 2010. Drouin, M., Ildefonse, B., Hirth, G., Waters, C.L., Godard, M., 2010. Crystallographic preferred orientations and melt-rock interactions : olivine-rich troctolites from IODP Hole U1309D. Abstract T23A-2228 presented at 2010 Fall Meeting, AGU, San Francisco, Calif., 13-17 Dec.